We use the word template a lot, here at Clock Wise. The Wiki definitions are many and the one that would get the closest to what we are talking about is a boilerplate template, or layout template, or design template. But don’t be fooled, there’s nothing “boilerplate”, as in boring or uncreative about our templates. We use templates to facilitate the process of getting videos that have a similar structure done quickly and reliably, so we can offer them at pricing that is suitable – or palatable – to small business owners. Video templates are different pre-determined video blueprints where length of clip, interface with graphic and music are pre-defined. All we do is choose the appropriate template for a client, put in the footage or still images, come up with the words and determine the color scheme and fonts. It sounds like a lot, but it saves us coming up with the animation of graphics, timing, music, etc. An edit template defines in advance, where the graphics go, what color and font they have, how the video clips are being used. 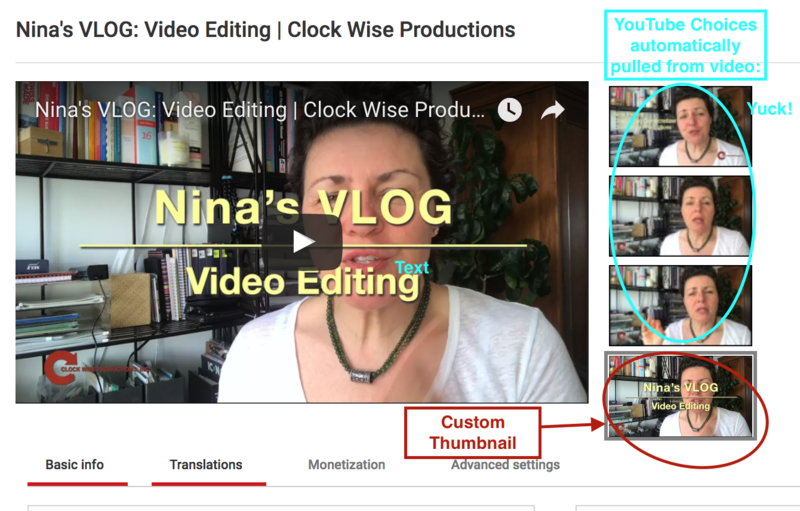 This speeds up the editing process AND gives the videos an unified look which will look great on your website or YouTube channel, or any other social media platform. Thumbnail: A thumbnail is a photo representation of a video. Thumbnails are used on YouTube and other video hosting services to ‘control’ the image that is shown on your browser before the video starts playing. Most hosting platforms allow you to upload a custom thumbnails so you can control that image. Transitions: dissolve, cross dissolve, fade in from black or white, and fade out to black or white: Video transitions are used to make cuts from one clip to another smoother, or to start and finish a sequence. Many in-phone apps have transitions which might be cute for social media, but really don’t belong into video marketing for businesses, unless of course you cater to an audience that appreciates dizzying transitions. The most common transitions are fading up from black and fading down to black. Those can be used at the head and tail of a clip, but also from one cut to another – the length of the transition can be as short as a few frames. Chroma key compositing, or chroma keying, is a visual effects / post-production technique for compositing (layering) two images or video streams together based on color hues (chroma range). The technique has been used heavily in many fields to remove a background from the subject of a photo or video – particularly the newscasting, motion picture and videogame industries. A color range in the foreground footage is made transparent, allowing separately filmed background footage or a static image to be inserted into the scene. The chroma keying technique is commonly used in video production and post-production. Captions (or Closed Captioning, CC) and subtitling are both processes of displaying text on a television, video screen, or other visual display to provide additional or interpretive information. Both are typically used as a transcription of the audio portion of a program as it occurs (either verbatim or in edited form), sometimes including descriptions of non-speech elements. A Transcript is the written audio of a video and is normally embedded below the video or on the same webpage to help search engines to crawl the text and index it for search engines to find the content. Pro Tip: If you use the Facebook captions for instance they only show up when you’re playing the video without audio (very cool, but only works on Facebook, not any other source). Both Captions and Transcripts are highly recommended for any video uploads on websites and YouTube. Looking for more tips and tricks to start your 2017 off right? Read my blog post Why I Stopped Caring About Trend Predictions, watch my VLOG: Best Practices for 2017, and check out our Curated Link Pack. A Video Player is a plug-in that allows you to play a video you have embedded in your website. There are several plug-ins that work very well. For WordPress I use Huzzaz Video Galleries, which is free and allows for several different ways of displaying your videos if you have more than one. For a single video I love embed.ly. It gives you a Short Code to embed on the WordPress page and couldn’t be any easier. It’s also not customizable, but it will honor the YouTube (or Vimeo) settings you have established. Hosting means uploading your video to the on-line platform where it’s playing. See also Native Video. Embedding means you are hosting the video somewhere else – YouTube for instance, or Vimeo – and are linking from there to where you want to play the video, like your website. For the embedded video to play you will need a Video Player, or a Short Code. TRT is one of those lovely acronyms our industry has. It stands for “Total Running Time” and refers to the exact length (to the frame) of a video. Mostly, for the casual user there’s no difference between RT (Running Time) and TRT, but if you are media buying, say for an advertising spot on the Super Bowl, your counting down to the frame. 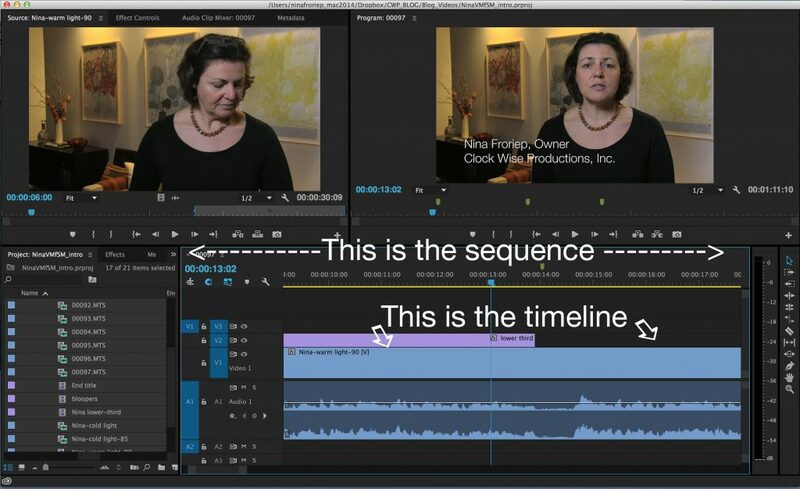 The video clips you are working with in an editing software are put into a sequence, which is defined as a set of things next to each other in a set order. And the timeline is the graphical representation of that chronological sequence of events (i.e. video clips strung together).